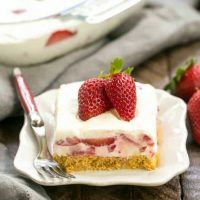 While the berries are ripe and juicy, it’s time to whip up this exquisite Strawberry Cheesecake Lush Dessert!! 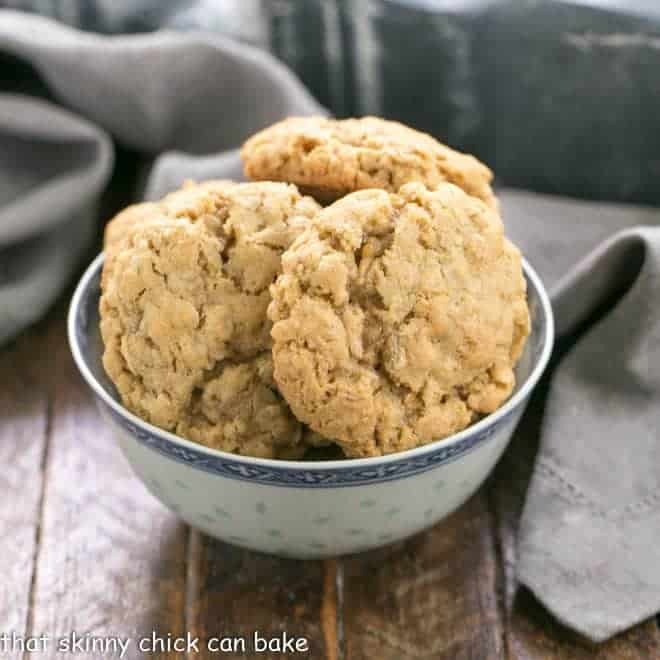 There’s no baking involved making this dreamy recipe perfect for summer dining! 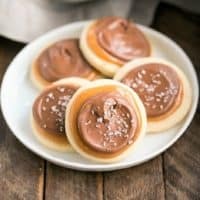 I’ve been seeing “lush” recipes all over the Internet. I’m not exactly sure what a lush is, but they all seem to be dreamy, creamy, no-bake fruit desserts. I’d say the majority have whipped topping and many use pudding mixes. The temptation to make a luscious “lush” dessert has been gnawing away at me all summer. Especially after drooling over these 21 No Bake Layered Dessert Lush Recipes! Plus, any dessert where you don’t have to turn on the oven, like this Peanut Butter Cookie Lasagna, is perfect for summer. No-bake desserts are wonderful for those sultry days. I decided to try my hand on a Cool Whip and pudding free version, hoping it would be tasty enough to deserve the “lush” title. With such beautiful summer berries available, I started experimenting with a strawberry cheesecake lush! It turned out to be heaven on a plate! The hubby gave this Strawberry Cheesecake Lush his seal of approval, too. If you love strawberry desserts as much as I do, check out this retro Mile High Strawberry Pie recipe, too. 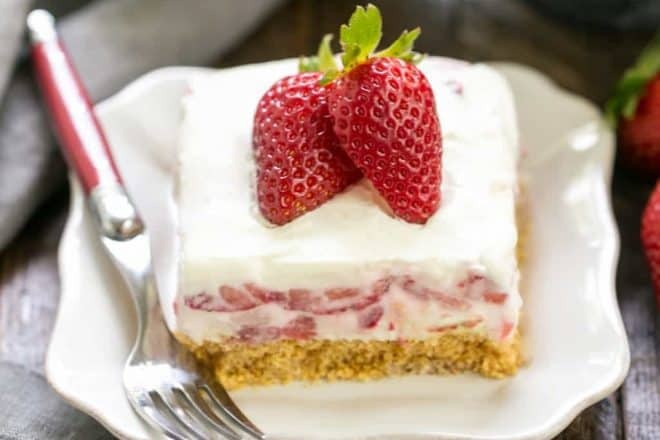 An exquisite layered strawberry dessert. Adapted from numerous recipes including Small Town Woman. Spray 9 x 13 pan with non-stick cooking spray. Mix together crust ingredients and press onto the bottom of the pan. Chill. In a stand mixer with paddle attachment, mix cream cheese, powdered sugar, and vanilla until light and creamy. Fold in sour cream and chopped strawberries. Spread over crust. Freeze for an hour to allow filling to firm up. Layer sliced strawberries over filling. Whip cream with powdered sugar and vanilla and spread over berries. Serve chilled. I did not bake the crust, so it was rather crumbly. If you’d like a firmer crust, bake it at 350 degrees for about 8-10 minutes. Cool before adding toppings. 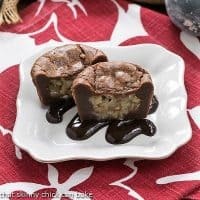 Sounds like a great week and I love this yummy dessert! Thanks Liz! 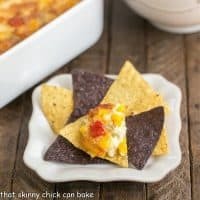 this looks wonderful I think I have everything but the sour cream got to make this ASAP! This looks great, just the perfect pudding for summer. I think your version looks beyond luscious. Lush with all capital letters! Beautiful too! I love no bake desserts. This looks beautiful and summery, Liz. 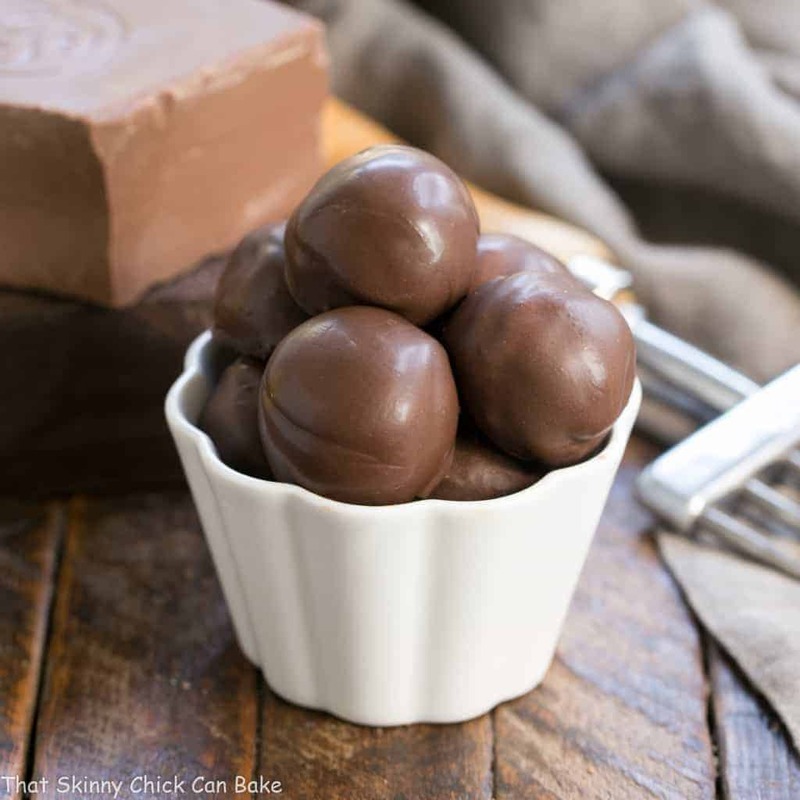 Liz, you always have the prettiest and delicious desserts ever…and this one is another winner..no oven and so easy. Thanks for the recipe! I knew this recipe was for me when I saw “lush” in the title, because I’lm a lush, and “dessert,” because that’s all I ever eat. Honestly, though, it looks beautiful. 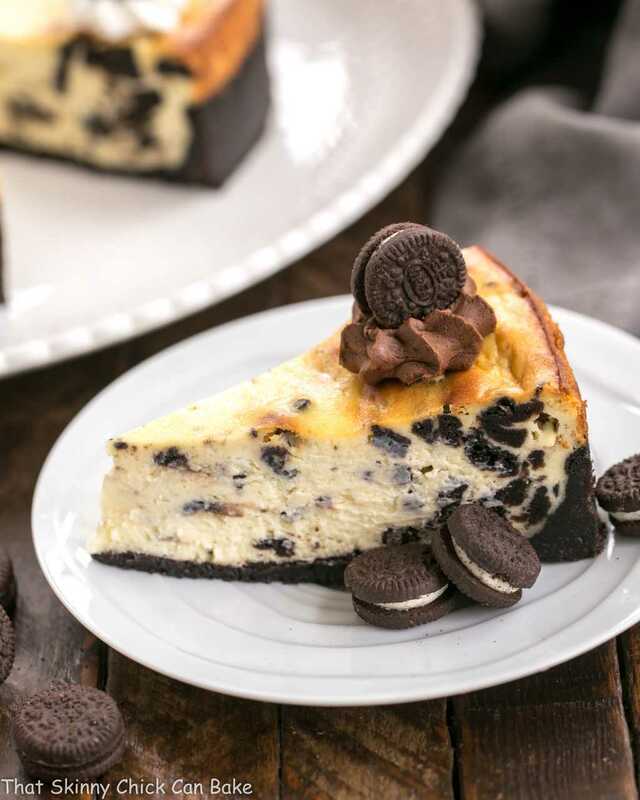 This no bake cheesecake sounds delicious. It is nice to not have to turn on the oven in the summer. OK I have not seen the word lush at all but I am loving it. 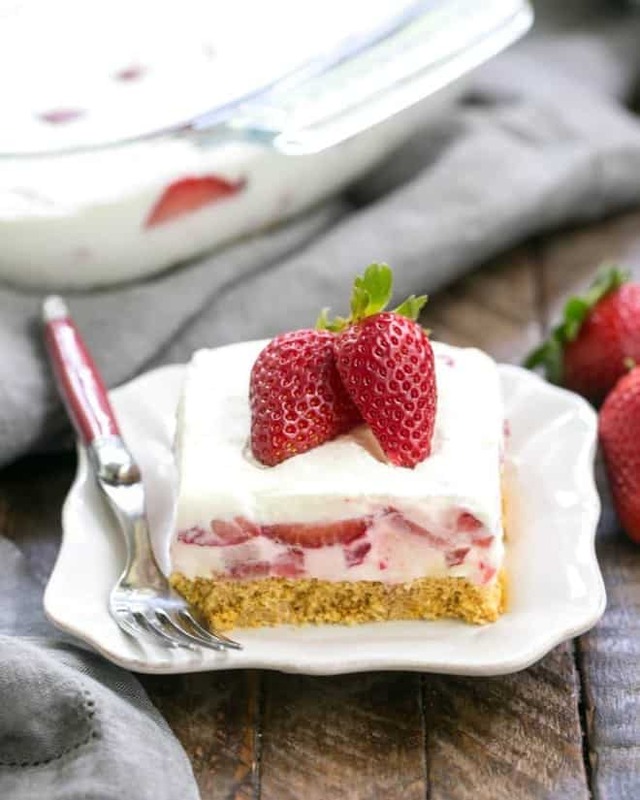 chesecake with sour cream and strawberries. Looks so great and summery. Liz, you make the BEST desserts. And this cheesecake looks so pretty and delicious. I bet it tastes divine. Perfect for summer parties. I love strawberry desserts. This one looks yummy. This lush is truly luscious! It looks creamy and dreamy, Liz. You definitely hit it out of the park on your first try! Nice to have a new version of an old summer favorite! Thanks! Oh, Liz this is one good looking treat! I’ve been away from blogging for a few weeks and I am loving this lush treat. Can’t wait to check out more of them! This looks delicious, Liz. And, you know I am always looking for easy. Graham crackers are my favorite thing in the world (what I would take to a deserted island) I always have an inventory of 4 boxes. Just need to pick up cream cheese and strawberries and I’m in business. There’s nothing better than sweet strawberries with cream! 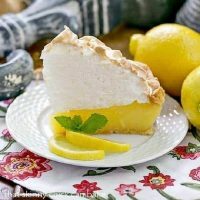 This is one heavenly summer dessert! 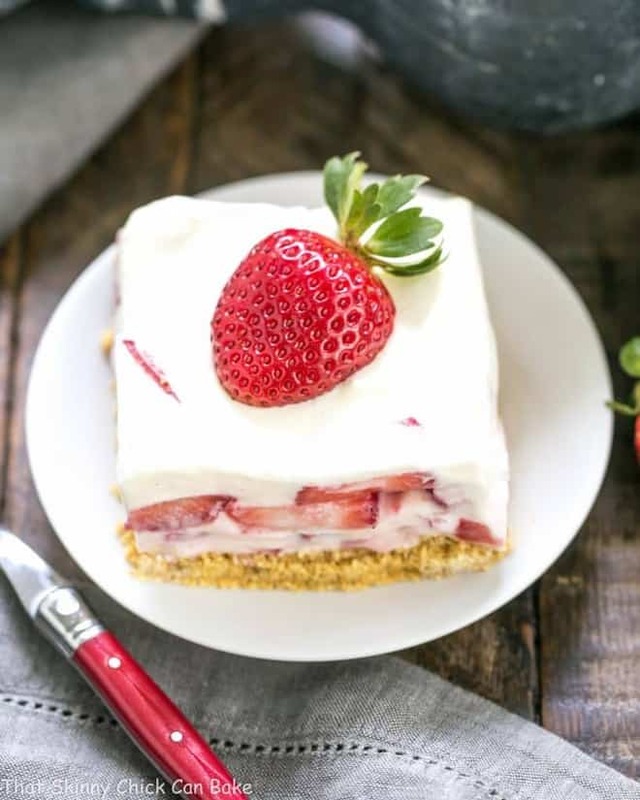 Your no bake dessert is like a divine strawberry sundae in cake form =) #yummy! Super pretty and lush, I’d give anything for a slice of that right now too.